Bajaj Auto has announced the launch of the 2019 Dominar 400. The upgraded model comes with revised hardware that gives it a more premium look than its predecessor. Priced at INR 1,73,870 (ex-showroom Delhi), the motorcycle is sold in dual channel ABS variant only and offered in two colour choices – Aurora Green and Vine Black. It is available across all Bajaj Auto dealerships. Bajaj Auto has announced the launch of the 2019 Dominar 400. The motorcycle has been priced at INR 1,73,870 (ex-showroom Delhi). Updated engine specifications now include a dual overhead camshaft. The 373.3cc, liquid-cooled single-cylinder engine with fuel injection now makes 40 PS power (+5 PS) and 35 Nm of peak torque. The performance upgrade has resulted in the power-to-weight ratio increasing from 192 PS/Ton to 217 PS/Ton. Hardware upgrades include a 43 mm upside down (USD) forks, new twin barrel exhaust and radial front callipers. Other key features include forged steel side stand, new mirror design with cast aluminium stalks, bungee straps, redesigned secondary display and spacecraft inspired tank pad decals. Dominar 400 has been able to create a strong following for itself and has become the preferred choice for city riders and long-distance tourers, alike. Customers have pushed the bike into extreme long distance and challenging geographies with aplomb, which inspired us to strengthen the sports tourer credentials in the new Dominar. 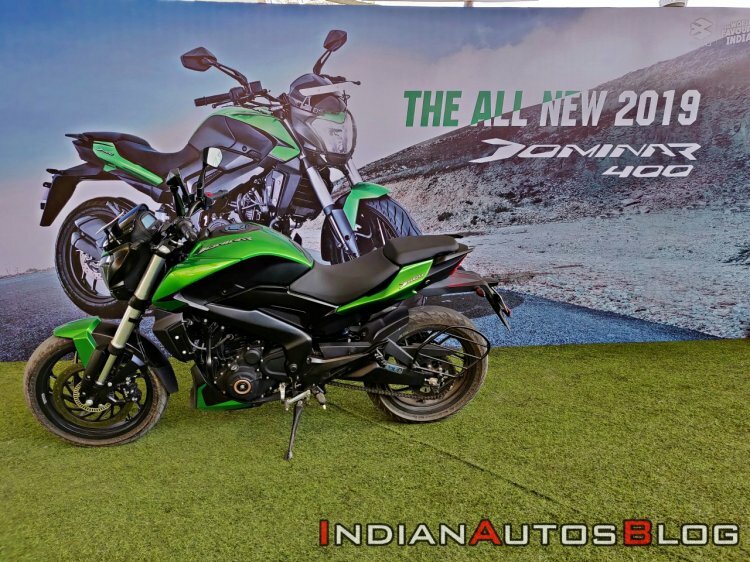 The 2019 Bajaj Dominar 400's engine packs 5 PS more power. The new model benefits from upside-down forks, new side stand and mirror stalks as well.